Thermography is basically the use of an infrared imaging and measurement camera that can actually "see" and "measure" thermal energy emitted from an object. 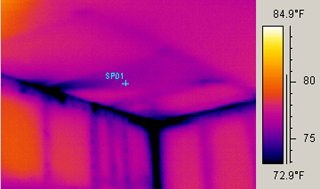 The camera can only sense the temperature difference that transfers to the most outer surface of a wall, ceiling or floor (and if the Delta T, or temperature difference, cannot conduct this difference to the outer most surface, then the infrared camera is unable to sense anything within the surfaces of a building). So it’s crucial to have a temperature difference of at least ten degrees Fahrenheit between inside and outside temperatures. Most materials that are moist or located inside inaccessible surfaces will have an absolute temperature difference in a seasonal situation due to conditioning the living areas with heat in the winter and A/C in the summer. If the A/C or heat is not conditioning the home, and the outside temperature is the same as the inside temperature, the infrared camera can not perform its intended function. Temperature differential is absolutely necessary for us to better interpret the camera images and its indicators. Thermal, or infrared energy, is light that is not visible because its wavelength is too long to be detected by the human eye; it's the part of the electromagnetic spectrum (EM) that we perceive as heat. Unlike visible light (in the infrared world) everything with a temperature above absolute zero will always emit heat. Even very cold objects (such as ice cubes), will emit infrared images. The higher the object's temperature, the greater the infrared (IR) radiation emitted. By detecting those differentiating thermal patterns that are invisible to the naked eye, we can point out concealed issues that need attention. These findings enable homeowners to perform repairs in a predictive fashion rather than in a reactive manner, which is going to be far more expensive and time consuming when these invisible issues finally become apparent. 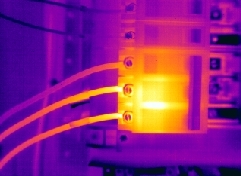 Infrared Inspection involves using a radiographic infrared camera to detect small differences in the temperature of surfaces of components in residential and commercial buildings. The images captured with our infrared camera are so detailed that many believe the infrared camera can "see" through walls. While this is not the case, by detecting small variations in the surface of a wall, floor or ceiling it is possible to identify certain hidden characteristics such as the location of wall framing members, the presence or absence of insulation and even the location of water pipes. The camera can be used in homes to perform energy scans, find hidden water problems, and evaluate electrical systems. You should know that while an infrared camera can be a great tool, it is only a tool. When performing an infrared inspection of a residential or commercial building it is crucial that the operator have a detailed knowledge of building science and experience in defect recognition. A good operator will know the areas where failures are likely and then use the infrared camera to either confirm or clear suspect problems. Don't you cringe each month at the sight of your energy bills (winter and summer). According to the U.S Department of Energy, the typical family will spend close to $1,600 a year on their home's utility bills, and unfortunately, a large portion of that energy is wasted due to the homeowner not being aware of the areas where the energy is being wasted. Are there areas in you home or building where it is drafty or you suspect insulation is missing in the walls? With a thermal imaging camera, we can see far more then a naked eye can see. Previously what took destructive testing (like ripping out walls) can now often be seen with a thermal imaging camera and a trained professional to interpret the results. Where are you loosing your heat / cooling? Where is cold air entering your home? These and other questions can be answered by a Energy Scan. Call us to scan your home for heat loss or moisture penetration. You will be amazed at what you see!! Note: If during normal home inspections, we see a stain or something suspicious on a wall, ceiling or in any other location, the infrared camera will be used to help identify and document the condition. We take the guess work out by using the latest technology to help you make an informed decision.